- Ramps, cracks, gullies, door guide rails. - Track or turntable use. - Power towing or driven wheels and rollers. - Any application other than manually propelled truck and trolley use. 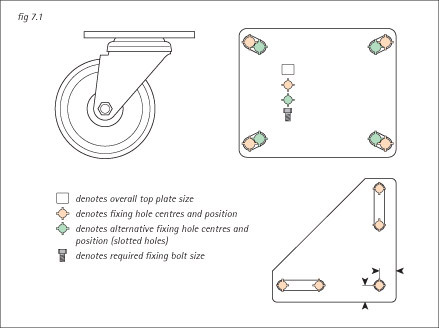 care to ensure that the lubricant reaches the king pin head on single ball race castors. lubrication, particularly in very dusty conditions. operating temperature range of -30c to +130c. grease. Please ask for details. catalogue. Please request a copy. are secured together by a heavily riveted steel king pin. swivel head forging giving an extremely strong construction suitable for heavy loads. transportation (i.e. loaded with goods and regularly moved from one place to another). regardless of the rated load capacity. are often used at their full capacity. components are described using differing terms by various manufacturers. 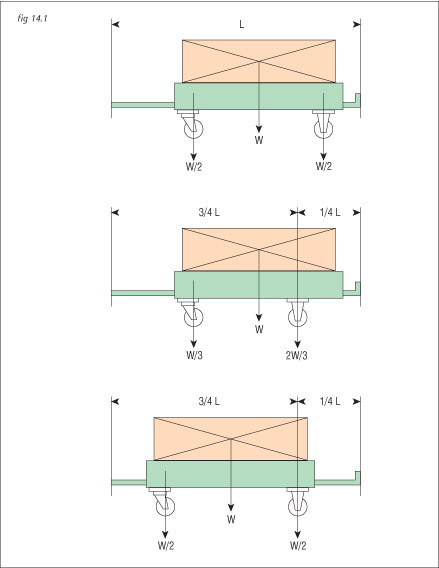 vertical axis of the swivel bearing with the castor wheel axle offset. A housing containing a wheel which is not to swivel about its vertical axis. the swivel bearing. Also known as the trail. 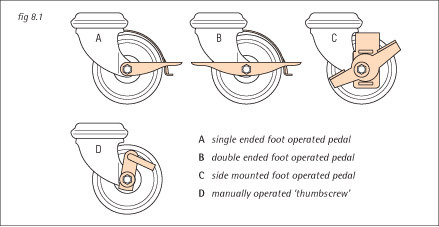 pedal may protrude beyond the outside edge of the wheel. 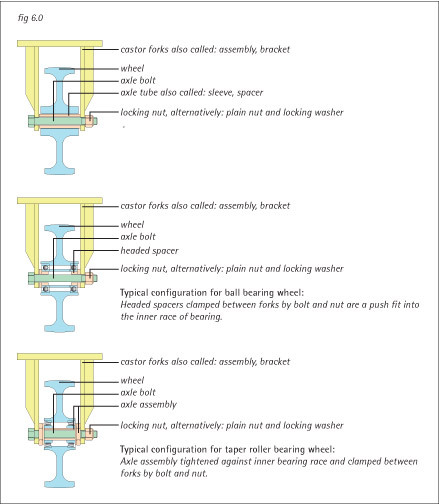 of certain fixing types, not necessarily the overall height of the castor (see diagram). The overall diameter of the wheel (including tyre, if fitted). momentarily up to about seven times the figure given above. bolt from beneath the swivel head or fixing to a stud attached to the equipment. A fixed stud attached to the castor swivel head. Usually supplied with a loose nut. headed bolt concealed beneath swivel head of castor. i. Assemble the bolt (A) to the castor so that the bolt head is inside the swivel head. i.e. Thread protruding from top of castor. ii. 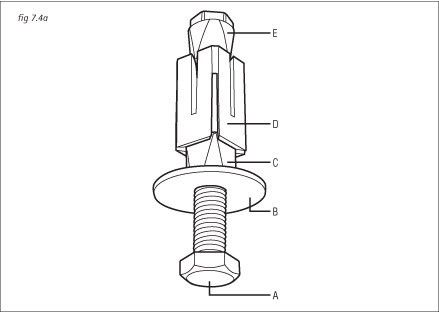 Slide washer (B) over bolt. v. Align flats on bottom cone with the flats on inside of sleeve. together and are in line but loose and ready for fixing. e.g. chair base. Commonly available with ball type or twin wheel furniture castors. mechanisms are fitted in either a ëleadingí or ëtrailingí position. ingress of dirt and and dust into the castorís swivel head. accumulation of thread from binding the wheel. generally be up to three times that of the equivalent sized hard tread wheels. particularly suitable for power towing applications. as a basic standard as these are generally the strongest and have the longest life. temperature applications, thermoplastic or phenolic resin wheels are also available. The overall width of the tread of the wheel at its widest point. bore represents the inside diameter of the bearing. essential for power towing applications. working conditions, should not require replenishment. sleeve is unnecessary and is therefore omitted. replenishment under arduous working conditions. 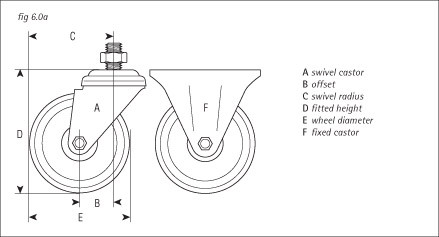 component of the proposed castor or wheel should be checked for compatibility. details of chemicals present in your application. castors before the bolts are finally tightened. straight runs. The trolley should normally be pushed with the fixed castors leading. to ensure stability on the unit. This arrangement provides good load capacity with excellent manoeuvrability. packing the fixed castors by approximately 25mm. 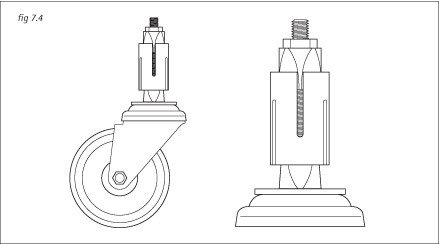 central wheels, usually by packing the central fixed castors by approximately 25mm. The load must be evenly distributed to ensure stability. speeds of up to 6kph. climb over it. In these circumstances the destruction of the castor is inevitable. mass of the whole train including the tractor. prevents the use of truck trains in narrow gangways. disproportionately between the swivel and fixed castors. the truck as shown in the third arrangement.